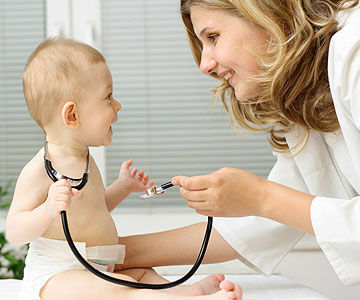 Child development is a basic science of child health care. Here is the key to best outcome the development delays to attain better future. Held in prone position with hand under abdomen Head held up momentarily. Elbows flexed, hips partly extended, knees flexed Pelvis high, knees drawn up largely under abdomen. Intermittent partial extension of hip and knee. Momentarily lifts chin off couch. Head predominantly to one side. @Almost complete head lag, back uniformly rounded. May hold up momentarily ATNR seen when at rest Flops at knee and hips. May be residual walking reflex when sole of foot is pressed on flat surface. Crawl position on abdomen, crawls by pulling self forward with hands Can go over into prone, or change from prone to sitting, sits steadily can pull self to sitting position Can stand holding onto furniture. Collapses with a bump. 24 weeks Holds bottle, grasps feet, palmar grasp of cube, drops one cube when another is given Rhythmic syllable chains When he drops a toy he looks to see where it has gone to and tries to recover it, smiles and vocalizes at mirror image, shows likes and dislikes, displeasure at removal of toy Differentiated social smile. Child smiles more readily when it sees familiar faces.